The facts: True, if “we” is taken to include Trump and his recent predecessors.Perspectives–He struck a unifying tone. For now.“When President Donald Trump’s speech ended Tuesday night, there had to be a question shared in living rooms and saloons throughout the country: Where has this been? … Before Republicans get too excited, they need to remember this is still Donald Trump. What Trump giveth in a 90-minute speech, he can easily sabotage with a 3 a.m. tweet. Someone should take his phone.” – Editorial Board, Colorado Springs GazetteA home run for Trump“Last night’s State of the Union address was terrific. A home run. … But we’ve learned that the tone of Trump’s State of the Union addresses and the tone of the rest of his presidency are, at most, distant cousins. … If Trump stayed off Twitter for a week, just as an experiment, it would be fascinating.” – Jim Geraghty, National ReviewThere was logic behind Trump’s zigzagging speech.“President Donald Trump’s State of the Union address, as it unfolded, was a dizzying and even disorienting experience, a cascade of rhetorical passages that seemed to contradict each other every few moments. … At first blush this all may have seemed like incoherence, as though the speech was a composite of recommendations from warring factions, every zig offset by a whiplashing zag. But taken as a whole, the address revealed a clear strategic purpose — one designed to revive and strengthen the ideological connection between the Trump of 2019 with the Trump who first began his astonishingly effective takeover of the Republican Party four years ago.” – John F. Harris, PoliticoHe almost appeared almost presidential.“Despite some jarring moments, he made a passable attempt at a presidential tone, calling for governing ‘not as two parties but as one nation,’ and speaking of a ‘new opportunity’ in U.S. politics for those with the courage to seize it. The question is whether these gestures are to be taken seriously.” – Editorial Board, BloombergCompromise — on his terms“The state of Donald Trump is unrepentant and defiant. And while he says he’s open to compromise and national unity — it must be on his terms. … The question now is whether the President did anything to help his precarious political position or to narrow entrenched political battle lines.” – Stephen Collinson, CNNRobert Mueller looms large.“It was one paragraph in this long, odd, terrible speech that gave away the game. … Trump knows his legal peril grows by the day, and he’s struggling to pry it off him while there might still be time. Robert Mueller wasn’t in the House chamber tonight, but Trump’s odd performance and shambolic affect tells you the president felt the special counsel’s presence.” – Columnist Rick Wilson, The Daily BeastHe failed the challenge.“The State of the Union address is one of those moments that allows Mr. Trump to play the role of president, with pomp, standing ovations and, sweeter still, a captive audience of his opponents. Even Mr. Trump grasps that, for this one night, he is called upon to rise above partisanship and address the entire nation rather than merely his rump political base. Christine Pelosi@sfpelosi #waybackwednesday – oh yes that clap took me back to the teen years. She knows. And she knows that you know. And frankly she’s disappointed that you thought this would work. But here’s a clap. #youtriedit 6:05 PM – Feb 6, 2019 Social media users widely described the clap as sarcastic. The image also inspired photoshopped memes showing Pelosi condescendingly clapping in various situations, as documented by the HuffPost. 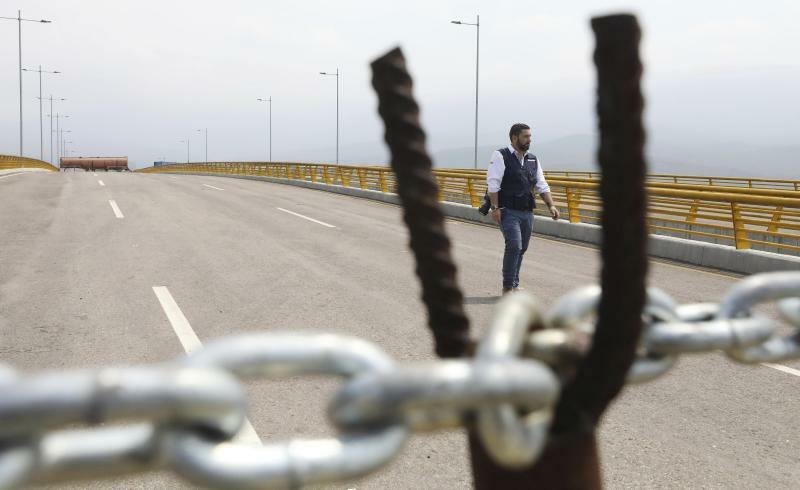 The aid squabble is the latest front in the battle between Guaido and President Nicolas Maduro, who is vowing not to let the supplies enter the country. Maduro argues Venezuela isn’t a nation of „beggars” and has long rejected receiving humanitarian assistance, equating it to a foreign intervention. Venezuelan Jose Mendoza stood at the entrance to the Colombian side of the bridge holding a sign that said: „Humanitarian aid now.” Mendoza, 22, said he is tired of seeing Venezuelans suffer from food and medical shortages and that the military should stand on the side suffering Venezuelans. 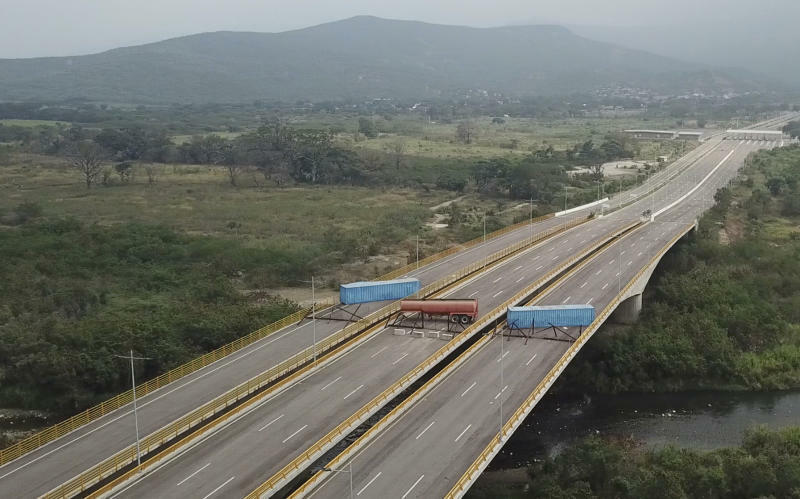 Guaido says the emergency shipment is a „test” for Venezuela’s armed forces, which will have to choose if they allow the much needed aid to pass, or if they instead obey orders. 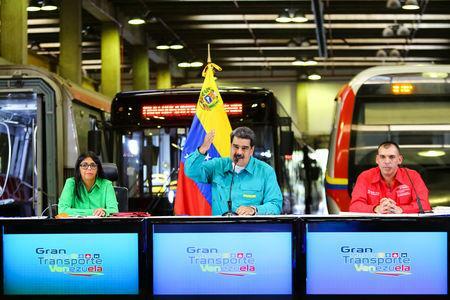 No details have been released on exactly how the opposition plans to get the shipments into Venezuela. „We don’t want to depend more on a food subsidies than is necessary today,” he said, calling the blockade an „absurd reaction from a government that doesn’t have the interest and well-being of Venezuelans” in mind. 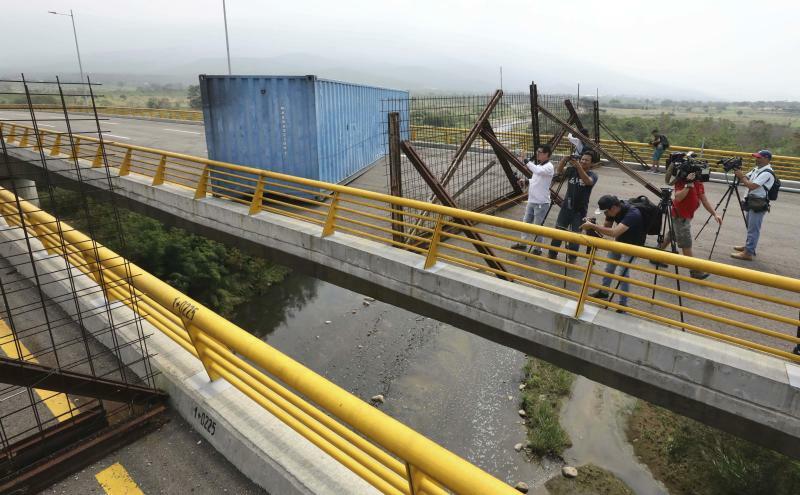 „We condemn the brutality of the Maduro regime, whose socialist policies have turned that nation from being the wealthiest in South America into a state of abject poverty and despair,” Trump said. „Committing such a crime would give even more reason for the unified countries to ask the International Criminal Court to investigate Maduro,” Trujillo told reporters after a meeting with the head of the Organization of American States, Luis Almagro. In the very moment he started to speak, President Donald Trump split his State of the Union address in two. Before giving the annual address to Congress, the president is traditionally introduced by the Speaker, whose chamber he’s visiting. It’s a nicety, a nod to the separation of powers being ceremonially set aside for the speech. But either accidentally or intentionally, Trump began his speech before Pelosi could introduce him. An otherwise by-the-book opening with tips to “Madam Speaker, Mr. Vice President” and his fellow Americans was marred by a slight against his archrival. It was symbolic of the entire State of the Union, which veered so wildly between soaring calls for unity and pitched partisan jabs that he may as well have given two different speeches. President Trump and House Speaker Nancy Pelosi shake hands at the State of the Union speech on Feb. 5, 2019. In one State of the Union, Trump called on Congress to set aside petty grievances and work together to cure childhood cancer, lower prescription drug prices, rebuild America’s roads and airports and end the HIV epidemic in the U.S. within a decade. He highlighted American heroes like pioneering astronaut Buzz Aldrin, reminisced about the defeat of the Nazis in World War II and called on America to reject anti-Semitism. In another State of the Union, Trump belittled congressional oversight as “ridiculous partisan investigations,” continued to call for a border wall that led to a partial government shutdown and argued inaccurately that Democratic governors in New York and Virginia had all-but endorsed infanticide with recent abortion bills. He referred to a “Democrat agenda,” a minor but annoying tic to the opposition party, and failed to congratulate Pelosi for becoming Speaker. Trump seemed to almost accidentally create a genuine moment of goodwill and warmth in the chamber when, while listing off the high water marks of the economy, he said women have filled 58% of the new jobs created in the past year. Dozens of Democratic women dressed in white in honor of the suffragette campaign for women’s equality stood and clapped. “You weren’t supposed to do that,” Trump joked. “Don’t sit down,” he added, “you’re going to like this.” Trump went on to say, “We also have more women serving in Congress than at any time before,” sparking a series of “USA” chants from the Democratic side of the aisle. A group of House Democrats cheer as they are acknowledged by President Trump during his Feb. 5 remarks at the State of the Union. At other times, the shifts in tone were abrupt, and undercut what had just happened. At another point, Trump highlighted the bipartisan criminal justice reform he signed into law in December, singling out two former inmates who were his guests. In a moment made for the State of the Union, Alice Johnson — whose sentence of life in prison Trump commuted after lobbying from Kim Kardashian West — wiped away tears as the tough-on-crime president spoke about disparities in sentencing and the possibility of redemption. “When I saw Alice’s beautiful family greet her at the prison gates, hugging and kissing and crying and laughing, I knew I did the right thing,” Trump said. Then, in a pivot so sharp it would turn a figure skater’s ankle, Trump shifted to calling on Congress to approve money for him to build a border wall or potentially face another painful government shutdown. In a play to the Republican base, the president returned to his standard dark talk of “ruthless coyotes,” “the savage gang MS-13” and “the very dangerous southern border.” At the mention of “large, organized caravans” a murmur of boos even started to surface among some Democrats before Pelosi signaled with her hand to stop. The contradictions were not just limited to the speech itself. Before the speech, many political observers noted that it could be Trump’s last chance for a big reset in his relationship with Democrats in Congress before House oversight, Special Counsel Robert Mueller’s investigation and the looming 2020 presidential race intervene. President Donald Trump used his State of the Union address to appeal for political unity, offering Americans a choice between „greatness and gridlock” while claiming to have shown strength facing down international threats from Iran to North Korea. But political scientists said the speech masked an essential point: Trump’s foreign policy has exacerbated many of the problems he’s trying to solve, claimed credit for progress to which it is not entitled and alienated key allies along the way. And those foreign partners – and even the foes – from Asia to Europe, from Latin America to the Middle East, voted with their rhetoric Wednesday by meeting Trump’s speech with silence. In fact, with the exception of a spokesman for South Korean President Moon Jae-in, who welcomed Trump’s announcement of a second summit with North Korea’s leader Kim Jong Un in Vietnam, Feb. 27 and 28, few said it warranted paying close attention. „My review of Trump’s second SOTU? Mostly the usual spurious assertions related to foreign policy,” said Karin von Hippel, a former senior counterterrorism adviser in the U.S. State Department and now director-general of the Royal United Services Institute, a London-based think tank that specializes in defense and military affairs. Hippel noted Trump’s speech did not even really mention his national security strategy and assertions such as that NATO members were spending more on defense because of pressure on the military alliance by his administration failed to acknowledge that non-U.S. spending on NATO has been increasing since 2015, before he took office. „Trump said the U.S. would be at war with North Korea if it weren’t for him, even though it is hard to imagine another leader ratcheting up the rhetoric to such a dangerous level,” Hippel said, referring to various incendiary barbs traded between Kim and Trump before they agreed to pursue face-to-face diplomacy over Pyongyang’s nuclear weapons ambitions. She added that Trump’s claim in the speech of a new approach to fighting the Islamic State group as being responsible for its defeat was also misleading. Late last year, Trump declared that ISIS had been defeated and announced plans to withdraw troops from Syria. Martin Bialecki, who edits „Internationale Politik” and „Berlin Policy Journal,” two Germany-based publications with a focus on international affairs, said Trump’s address was an „America Alone” speech. „He made a lot of reference to World War II and the great history of the U.S. in that regard. He also made it crystal clear that the U.S. will not be reclaiming political leadership any time soon. Trump preferred to look backward. From a European point of view, this is still deeply troubling,” Bialecki said. North Korean leader Kim Jong Un, left, and President Donald Trump shake hands on Sentosa Island in Singapore on June 12, 2018. German Chancellor Angela Merkel? British Prime Minister Theresa May? French President Emmanuel Macron? None of the offices of these traditional close U.S. allies released messages of support or dissent in reaction to Trump’s remarks. In other words: How is Trump’s speech playing overseas? Well, it’s not even playing. „Iranians – including our Jewish compatriots – are commemorating 40 yrs of progress despite US pressure, just as @realDonaldTrump again makes accusations against us,” Foreign Minister Mohammad Javad Zarif tweeted Wednesday. This month, Iran is marking 40 years since its Islamic Revolution overthrew Iran’s U.S.-backed monarch. „He once again defended his decision to unilaterally withdraw from the Iran nuclear deal, claiming this would insure that ‘this corrupt dictatorship never acquires nuclear weapons,'” she said. Slavin warned that Trump’s ‘maximum pressure’ and sanctions could lead to Iran no longer complying with the 2015 nuclear agreement because it hasn’t received the promised benefits. Slavin noted that Trump also distorted Iran’s policies toward Jews. „While it is true that Iranians are obliged to chant ‘Death to Israel’ at government-organized rallies and that Iran supports militant groups that have killed Israelis, Iran has never threatened ‘genocide against the Jewish people’ as Trump asserted. In fact, Iran still has about 10,000 Jews – the largest Jewish population in the Middle East outside Israel – Jews are free to worship in Iran, unlike Saudi Arabia, and there is an appointed Jewish representative in the Iranian parliament,” she said. She had a warning, too. „The U.S. has a long track record of leaving places worse off than before, most recently Honduras, Haiti and Nicaragua. President Trump’s hawkish exhortations and his order for countries to take sides on the Venezuela crisis is reminiscent of a return to the Cold War and this policy of military interventions,” she said. Maduro has previously warned Trump that he risks turning Venezuela into a new „Vietnam War” and „staining” American „hands with blood” if his administration, and military, intervenes in Venezuela’s internal affairs. Maduro and Guaido offered no reaction to Trump’s speech Tuesday night. In the speech, Trump also made clear that he believed he was on the winning side of aggressive trade negotiations with China. „We are now making it clear to China that after years of targeting our industries, and stealing our intellectual property, the theft of American jobs and wealth has come to an end,” Trump said. Beijing’s retort: the sound of tumbleweed in a windy desert. „Trump repeated familiar criticisms against China,” said Thomas Bernes, an economist at the Center for International Governance Innovation, a Canada-based think tank. „As such, it misses an opportunity,” he said. Though he had his moments on Tuesday night, it was clear by the end that no reset was coming. „With a range of more than 1,300 km … this cruise missile needs a very short time for its preparedness and can fly at a low altitude,” Iranian defence minister, Amir Hatami, said in remarks carried by state television during the unveiling ceremony. Mr Hatami said the new surface-to-surface missile, named Hoveizeh, was from the Soumar family of cruise missiles, which were unveiled in 2015. Iran said in January its bid to launch a satellite failed after Tehran ignored US warnings to avoid such activity. Washington warned Tehran this month against undertaking three planned rocket launches that it said would violate a UN Security Council resolution because they use ballistic missile technology. This system would automatically launch missiles—without the need for a human to push the button—during a nuclear attack. But the system, known as „Perimeter” or “Dead Hand,” may be back and deadlier than ever. Zvezda: „Will we have time to answer if the flight time is reduced to two to three minutes when deploying medium-range missiles near our borders? In this version, all hope is only on Perimeter. And for a retaliatory strike. Or was Perimeter also disassembled for parts? Michael Peck is a contributing writer for the National Interest. He can be found onTwitter andFacebook. 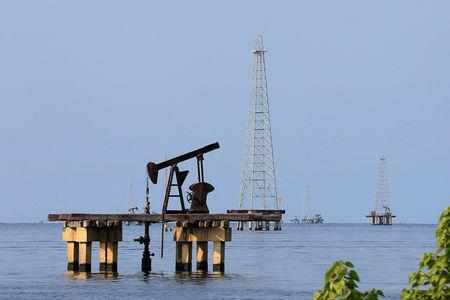 CARACAS (Reuters) – Venezuela’s opposition on Wednesday said it would use a U.S.-based fund to receive some of the country’s oil income in a key step to bankroll its efforts to dislodge President Nicolas Maduro. 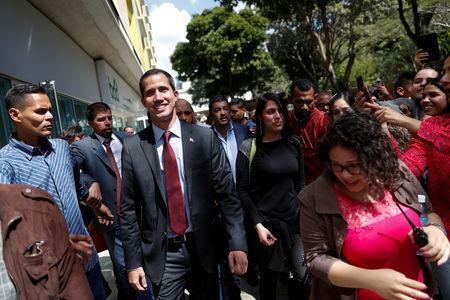 White House national security adviser John Bolton said on Wednesday the United States would consider lifting sanctions on senior Venezuelan military officers if they recognize Guaido as interim leader. „If not, the international financial circle will be closed off completely,” Bolton wrote on Twitter. „This is already quite advanced, I hope that next week it can be announced by our representative in the United States,” Paparoni said, though he did not give details about the nature of the U.S.-based fund or the financial institution involved. „We will keep working so that not one more gram of gold can be sold,” Paparoni said. Coming soon: Kiev’s navy-killer missiles. First, Ukraine must contend with an increasing, but still modest defense budget of $3.1 billion as of 2018. This problem has been partly offset with a large stream of US foreign aid– and more recently, direct lethal aid— but Kiev’s resources remain thinly stretched across a wide range of expensive projects. To the extent that external aid has fueled Ukrainian military modernization, prospective aid decreases in the future could just as easily force Kiev to shelf some of these key modernization projects. Secondly, Ukraine is still coping with the rift in its supply and production chains left by its diplomatic break with Russia. Whereas the Kh-35 and its predecessors were created with the USSR’s massive economies of scale, Ukraine must now invest in new, potentially less efficient production processes while repurposing Soviet-era components whenever it can. The latter is particularly salient for Neptune, given that it runs on a close derivative of the Soviet-era TRDD-50engine. Nonetheless, Ukraine has forged ahead with Neptune. Last year, Kiev announcedthat they had conducted Neptune’s first successful flight: “During the successful tests, the missile’s flight efficiency and systems operations were checked,” according to National Security and Defense Council Secretary Oleksandr Turchynov. “Today’s tests have opened a new stage of the missile program, according to which our Armed Forces must receive powerful high-performance cruise missiles that can accurately strike hostile targets at great distances,” Turchynov added. On the heels of this highly-publicized test, defense expert Serhiy Zgurets toldUkrainian news that Neptune will be deployed within the next three years. This would put Neptune at a ten-year development cycle, roughly the same interval as the creation of the original Kh-35 in 2003 and the introduction of its Russian “Uranus” successor in 2015. Washington (AFP) – Kosovo’s leader said Tuesday that Serbia’s traditional backer Russia had promised to support eventual reconciliation between Belgrade and Pristina, removing one potential obstacle in stalled talks. President Hashim Thaci said that he spoke to his Russian counterpart Vladimir Putin in November, in the first-ever meeting between the two sides, on the sidelines of centennial commemorations for the end of World War I. „I asked him very directly — what would Russia’s reaction be if Kosovo and Serbia reach an agreement? His reply was that he will support it,” Thaci said at the Council on Foreign Relations in Washington. „His reply was that we cannot be greater Serbs than the Serbs. I cannot say I was impressed, but I would really welcome if he keeps his word,” he said. Russia enjoys veto power on the UN Security Council and has strong cultural and political ties to Serbia, which has campaigned to shut Kosovo out of the United Nations and other international organizations since it declared independence in 2008. Kosovo, whose population is mostly ethnic Albanian, broke away from Serbia after a bloody 1998-99 guerrilla campaign and bombing by NATO, which continues to station a peacekeeping force in Kosovo. EU-led talks for reconciliation have made little headway. US President Donald Trump recently wrote a letter offering US assistance to broker a deal. But Thaci also faces opposition at home, with Prime Minister Ramush Haradinaj rejecting the president’s idea for territory swaps with Serbia. „I am convinced that this will close once and for all the war between Kosovo and Serbia and open a safe way for membership in NATO and the EU” for both countries, he said. He pointed to the recent resolution of the decades-old name dispute between Greece and Macedonia, which agreed to rename itself the Republic of North Macedonia, as a sign that deep feuds can end.